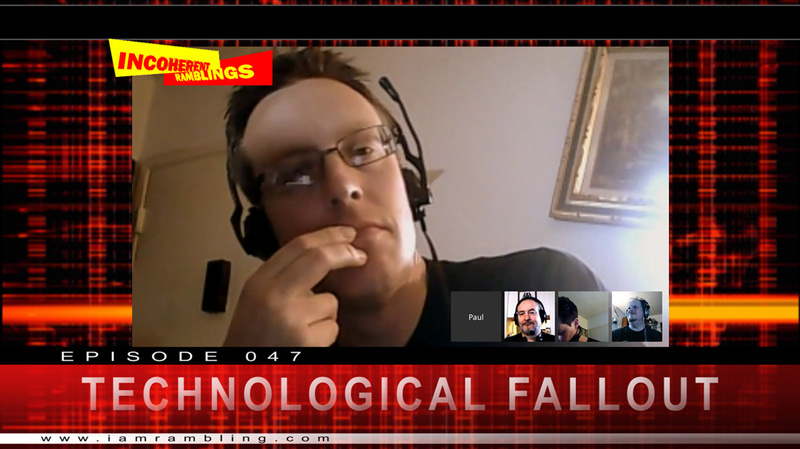 This week we’re posting Episode 47 with some crappy first-run live video. The week(s) after expect some high quality video from your Incoherent Ramblings crew. Pablo deep in thought. “Where is my lost cigarette?” he ponders. It pleases me to announce that this weekend’s podcast and all following are slated to have accompanying video. Sure we’ve been posting our episodes to Youtube all along but they were only a title card throughout the show. Sunday we’re posting our very first attempt at going live video with 4 cameras at the recording. We used hangouts to coordinate things but let’s just say it didn’t go according to plan. Being in the same room together and sharing WiFi for streaming bi-directional video on 4 devices… it left a lot to be desired. The video was often stuttered, delayed or blocky. The sound from the hangout was horrendous. Not to worry, we also recorded with our usual mics so the audio version of the podcast has been looped in to save the day. In addition to those problems we suffered audio cross-talk between devices which made the hangouts server switch from camera to camera like a room full of monkeys on amphetamines at the controls. All in all it was a learning experience. Call it an experiment. To imperfectly quote Monty Python; “We got better.” In post adding titles and an animated background should distract the viewer from the mess that the hangouts feed became. To be fair it looks much better than I anticipated and it’s fun to see our reactions to each other even if the wrong face is often on screen. Post was an opportunity to spruce up the graphics for the next stage. Yes, that’s the important part of experimenting. You learn from your mistakes and plan for the next iteration. We have since recorded 2 more podcasts with video and changed the formula. Instead of using 4 devices on hangouts we have opted to use 2 cameras recording to local memory to be cut together in post. We hit some speed bumps with that setup too but the quality of the results are spectacular. When we launch Episode 048 – Superstition on June 1 you’ll see the fruits of our labor. Just a reminder that the audio podcast is still available in it’s usual mp3 format for our subscribers. We made every effort to maintain the audio podcast even though we occasionally have been playing it up for the cameras. Yes, we’re human. And we’re showoffs. Come one, come all, listen, watch and enjoy!